This is a small production 100% estate Pinot Noir from Russian River Valley. 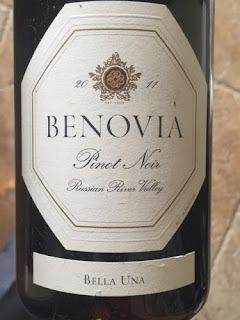 Mike Sullivan one of California's most talented winemakers heads up the project at Benovia and creates some really spectacular pinot's. Benovia for me however has always been on the spectrum of rather extracted and fuller bodied pinot from Russian River. That's not to say that the wines are superb, however I tend to gravitate a bit more towards a more soft and elegant style. On the nose this wine exudes beautiful aromas of black raspberry, black cherry, cedar, anise, and creme de framboise liquor. The presence of toasted oak is most definitely still on the forefront of the aromatic experience in this wine's youth. On the palate these flavors translate....black cherry is the dominant fruit characteristic, followed by notes of ripe plum and that same framboise liquor type essence. The wine is viscous in nature and rather full-bodied and packs a strong punch of french oak vanilla and cedar flavor. It's a polished wine with plenty of youth and exuberance. This is wine that needs time. 2011 was a vintage with cool weather and needed specific attention to detail in the cellar. You can tell this wine is young and needs time to meld together still in order to shed it's true aroma and flavor profile. Because of this youth and power right now things seem to be a little one-dimensional in terms of complexity. For this reason I won't place a score on this wine yet.